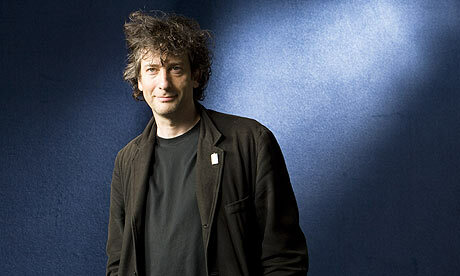 There's a terrific article/interview in the Guardian about it (I even like the photo, even though I cannot explain the hair) at http://www.guardian.co.uk/books/2009/nov/18/neil-gaiman-graveyard-book-awards. I will not even attempt to explain the hair. It must have known what it was doing. Gaiman, 49, said: "I definitely don't write like Kipling but he was a literary hero as a kid. "I was fascinated when I first started mentioning that I thought Kipling was an amazing writer. "I started getting – not exactly hate mail – it was more disappointed mail. "People would tell me, 'How could a writer like you – that we like – like a fascist, an imperialist dog?' "
Neil Gaiman, the author behind the surprise film hit Coraline, received "hate mail" for professing that Rudyard Kipling was one of his literary heroes. I keep forgetting about the new-style sensationalist Daily Telegraph. I like the way that "not exactly hate mail... disappointed mail" in the body of the article turns into "hate mail" in the headline. And was Coraline really a surprise hit? And is mentioning the Coraline film really how the Telegraph audience would go from "Who...?" to "Oh, right, him." You've often talked about the rights for readers to choose the books they want to read without censorship. What are your thoughts of a library in Kentucky firing two librarians who restricted reading materials to a child? She just didn't want this book in the Graphic Novel section, which is located next to Young Adult Fiction. She wasn't trying to keep it from kids. She was keeping it from everyone. Then a customer put it on order, and the computer would no longer keep it checked out to keep it off the shelves. She violated library policy by finding out who had it on order, discovered the person who wanted it was an 11 year old girl (no information has been given as to whether this was with or without parental knowledge, but I don't think that would have mattered to this lady) and she persuaded another library worker (also not a librarian) to help her stop anyone getting the book. Around this point their plan was exposed. They'd violated enough library rules and policies that they were dismissed. Strangely enough, even after they were fired, the original lady who took the book off the shelves still hasn't returned the book, which seems to me to have crossed the invisible line that separates "stopping people reading things you don't like" from "stealing". The events are summarised at The Beat here, with a two page local newspaper article that presents a fairly balanced picture of the events here. So my thoughts of a library in Kentucky firing two librarians who restricted reading materials to a child? I think the library did the right thing. And I think they should get their book back from the lady who stole it. And finally, someone on the NPR blog wrote about Sandman. It's meant to be a nice review of the P. Craig Russell Sandman: Dream Hunters, and I think it was probably meant to be funny, but if so the author seems to have misjudged the tone, and instead just turned out a series of patronising cliches about somebody's idea of Sandman readers. Which puzzles me, because I've met hundreds of thousands of people who read Sandman all around the world, and they look just like everyone else: all they seem to have in common is that they are intelligent bipeds capable of understanding comics, who like Sandman. Probably a lot like the person who wrote the article.